is now online, click here. This is a new website cataloguing recent discoveries and updating the information in the printed volumes. Farming in Miniature covers British-made toy tractors, implements and horse-drawn farm vehicles up to 1980. This is a lavishly-produced hardback book in two volumes. Volume 1 covers manufacturers alphabetically from Airfix to Denzil Skinner, and was published in October 2013, while Volume 2, covering the remainder of the alphabet (Dinky to Wend-al), was released in October 2014. The book is 11"x12". Volume 1 contains 360 pages and 970 photos, while Volume 2 has 432 pages and is just as lavishly illustrated! Farming in Miniature is the result of five years research, writing and photography by the authors. Farm toy vehicles in all materials are included, from wood and tinplate to lead, zinc and aluminium cast models, to plastics. For each manufacturer there is a company history, followed by a detailed description of the farm vehicles produced, cross-referenced to the photos. We have attempted to illustrate all major variations of colour and packaging. Even if you do not specifically collect farm toys, the company histories are fascinating, as they range more widely than just discussing farm items, and the farm models are set in the context of model toys generally. 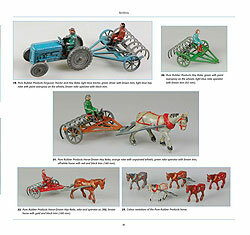 Volume 1 inevitably has a large number of pages devoted to Britains, our most prolific farm toy manufacturer, but other highlights of this volume are the extensive farm ranges made by Benbros, Chad Valley, Charbens, Corgi and Crescent. Highlights of Volume 2 include chapters on Dinky, Kayron, Johillco, Lipkin, Matchbox, Maylow, Mettoy and Timpo. There is also an Addenda to Volume 1. This page from the Benbros chapter shows some of the superb photography in the book, with detailed captions. See this review in Collectors Gazette, and this one on the Small Scale World blog. Single volumes are available from Turpin at £49.95 each, but you can find them cheaper on Amazon - click on the links for Volume 1 or Volume 2. 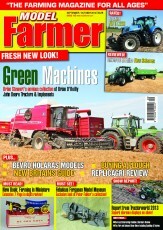 Model Farmer magazine gave each volume a highly enthusiastic review, reproduced below. "It was with great anticipation that Old Pond Publishing sent an e-mail earlier this month informing us that our review copy of Farming in Miniature was in the post. "I must confess that although I take great interest in the most modern of farm model and toy releases, it is those models from the 'past' that provide the most interesting characteristics of this hobby. In my opinion of course! I guess it's the scarcity factor driven by playability, knowing that toys from before I was born in 1984 were played with. Of course, models were collected back then and sat on shelves, but it is the notion, for example, that amongst the thousands of Britains MF595s that were produced, only a handful probably remain in pristine condition because the majority were destroyed by 'play' all those years ago. The interest then leads on to the 'hunt'. The search for these toys decades on, to try and source a 'mint' example, or as close to mint as we can get, knowing it's almost impossible to find anything from the past in this condition. Looking on the internet through eBay listings and various auction house catalogues. Even scouring further afield such as America for old farm toy relics. It's what I do because the satisfaction of finding something on that rare occasion is incredibly rewarding. Not that it happens very often, but it does happen. A few of my 'finds' are even in this book, which I guess provides evidence that if you look hard enough, you'll sometimes find what you're after. Such searches are typically spurred on by variations. To find something that differs from the norm, something that few people will have, sometimes because you have the only one! Again, I have been lucky to find such items and it is a nice feeling to have such things in a collection. The financial implications of such items are obviously sometimes a burden, but generally you shouldn't have much to worry about if you have one of only a handful in the world! A page of Crescent tractors. "There are numerous ways of collecting and many will disagree with the way I collect, but I'd like to think that those who do have similar habits will share the same avid interest in this book, Farming in Miniature, that I have. 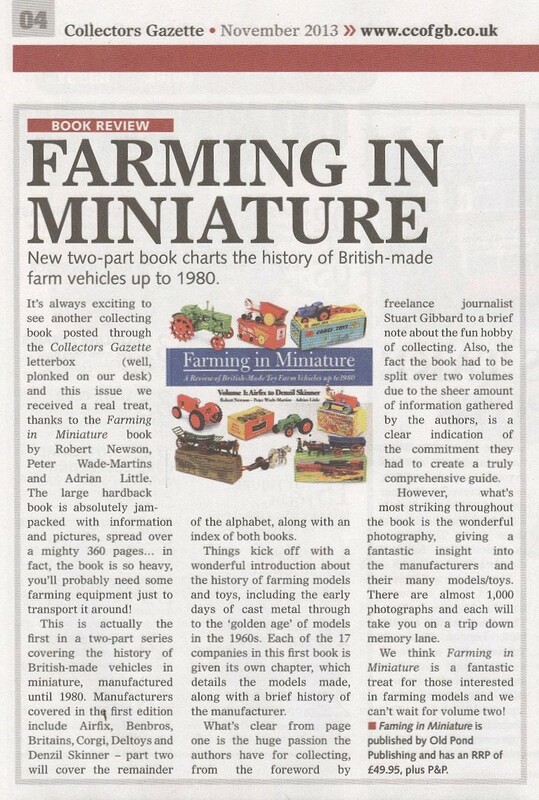 "The main reason is it collates just about everything we search for when trying to find farming miniatures of the past into one hugely interesting book. "Manufacturers in this first volume include Airfix, Britains, Crescent, Charbens, Denzil Skinner and some others some of you may have not known even existed. There is a comprehensive dialogue of the history and manufacturing habits of each toy and model producer. I was interested in history at school, so I found such sections very interesting. Particularly when information I thought to be true turns out to be false! "There are some particularly fascinating facts in the Airfix chapter. In addition, the history of manufacturers such as Benbros also appealed to me since I knew little about this brand before reading the book. It's such a concept which occurred for me on the majority of pages, to be honest. 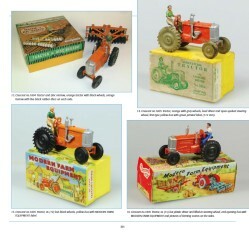 I know quite a lot about farming miniatures before 1980, but there's so much more I didn't know. The book provides a great lesson and I have learnt far more in the space of three hours reading than I have done in 10 years of being interested in the hobby and grasping for facts on the internet. It really is that informative. Those fans of horse drawn farming equipment will also be pleased about the book. There is plenty of coverage, and in volume one, Britains and Charbens are significantly covered. Some very scarce variations are seen too. There are of course many pieces of information that many readers will already know, but even then, the way the book presents such topics makes it thoroughly interesting to read. I was of course keen to find out things I didn't know and I am confident that there will be few readers, aside from the authors, who will have seen every model in this book. "Such an example for me were the Crescent implements and sets. I had good knowledge of the tractors, but some of the implements were a complete surprise to me. The hayloader was one item I had never seen before. Variations in older toys is something I enjoy looking at, and it is this analysis from the authors that really delivers an exceptional resource for the collector and enthusiast. Not only variations by colour, those by tyre choice or material make for very interesting reading. For me, this part of the book provides the most enjoyment. Again, seeing things you didn't know existed. I'd go as far as saying the book had a 'wow' effect for me. Turning over page after page and seeing things you just would not expect. For me, the biggest surprise was the Charbens Large Tractor variations. An unfortunate thing of all of this though, is it vastly extends your collection wishlist if you like to collect older farming miniatures. 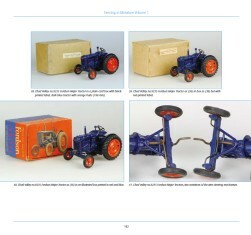 Chapters on Benbros and Crescent again show some extremely scarce model tractor variations. The Fordson Dexta in different colours and the Crescent Ferguson are just two examples. I was lucky to find a red Crescent Fordson Dexta at the Spalding Tractor Show a few years ago and I was pleased to see it included in the book. I had also not previously seen the chrome Denzil Skinner Nuffield, nor the trailer that this manufacturer had produced. Now that I do know, I'm keen to try and find examples in the vast buyer's market out there, but chances are slim of ever seeing one! Which again is why this book is so exceptional. Pictures are generally of excellent quality and the authors have worked hard to provide even the oldest of resources in pictures if a known example exists. Notably old magazine cuttings and catalogues. It's human nature to be drawn towards the pictures, but please pay attention to the text when going through the book. The authors again have listed each item and described the miniature in some detail. It's here as well that you learn about concepts of rarity and the types of things to look out for if, for example, the only difference is a steering column or tyre print. You'll also see that the book has plenty of tables listing each chapter's contents and references to future reading. You'll be glued to this book for quite some time though. Of course, we do not want to spoil it for you, but hopefully our positive endorsement will be enough to make you go out and buy a copy. I certainly look forward to volume two due next year." A double-page spread of Charbens Farm Wagons in different colours. 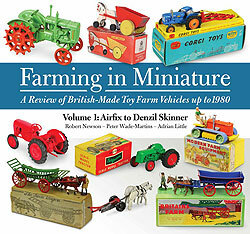 "Wow factor was one of our opinions used in the review of Farming in Miniature Volume 1. The book was found to be such an incredible resource that it was deemed a must-have if you had any interest at all in obsolete farming replicas from pre-1980. A collecting bible essentially, that page by page assists you in determining either what you may not have in your collection, or perhaps a clarification of what you do have. Either way, the book holds incredible value to this hobby and will do so for years to come. "Such was the comprehensiveness of the authors involved in Farming in Miniature that two volumes have been required. Volume 2 has now arrived, which completes the publication, covering Dinky through to Wend-al. Volume 2 also includes an Addenda to Volume 1. 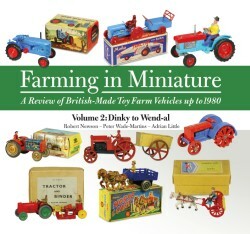 "I have a knowledge of farming miniatures, as outlined in my previous review, but this is a mere fraction in terms of what really is out there in the world of replica farm toys and models, as revealed in these books. In most collections around the country, I suspect many simply delve into the surface, not knowing the true potential of miniatures much deeper within the hobby. "Variations being one factor of this analogy - I found myself once again repeatedly thinking 'I didn't know about that' as I moved through the pages and chapters contained in Volume 2. Even Dinky had a few surprises for me such as the Leyland 384 prototype in bronze. "From a personal point of view, I enjoy finding variations, but the most subtle such as slight wheel tweaks or steering wheel positions (for example) don't normally find their way on to my model buying checklist. Those that do note such small adaptations of these miniatures will be pleased to know the book covers them in some depth. For me, colours are most interesting, and once again Volume 2 springs surprises for my own interests, such as those in Maylow and Matchbox models. "Similarly, I was most astounded to read the vast chapter on Kayron (& co.) models. Whilst there is an abundance of horse-drawn farming miniatures in both volumes, the chapter on this (to me previously unheard-of) manufacturer is vast. There are several lesser-known model makers in Volume 2. Dragon Toys, Fairchild, Kleeware, Leeway, Primus, Sontaw... the list goes on. I wonder how many of you reading the book have these in your collection? If you don't, you'll enjoy, like I did, finding out about them. "I enjoyed reading about Mettoy. These colourful tinplate toys were extremely popular 'back in the day'. Likewise the chapter on Mills possibly stands as my favourite. Rarity interests me, and to see three more variations of Mills-made models in the book really stood out. The famous Ferguson Demonstration Model by Mills is of course covered, and to see a Dearborn tractor example in the same format was astounding - something that most of us will never see in the flesh. Indeed the majority of models will highly probably be in only a handful of collections in the world, which leads me on to my conclusion. The vast majority of content in this book will never be seen in the flesh. It's why the publication is so important to the hobby. It represents a history of the hobby that we won't get back. Most miniatures produced are either destroyed or playworn to the point of unrecognisability. "The next best thing, though, is a high quality resource with fantastic images and in-depth research. This is why you must buy Farming in Miniature, both Volume 1 and now Volume 2."